Home Energy Audit – What is it? Is My Older Thermostat Causing My Furnace to Fail? Heater Trouble? Check Your Thermostat! The bad news: It’s the middle of winter and your heater seems to be experiencing problems or a malfunction of some kind. The good news: It may not be a problem with the actual heating system at all! Pretty frequently, when an HVAC system doesn’t operate the way it should, the problem is actually with the thermostat. Sometimes you may still have to call in a professional for Pittsburgh, PA thermostat services, but oftentimes you may be able to “fix” or at least address the issue all on your own. “Fan Only” Mode: If you see the words “fan only” on your digital thermostat screen, then it means that the fan in the blower unit of your furnace or heat pump is on, but no heating is actually taking place. A fan is simply there to move air, and while it can help take some of the staleness of the air out of the room, it’s not intended to be used for conditioning your living space. On/Off: Hopefully, this is the first thing you checked. But often, homeowners in a new living space or with a new thermostat may not even realize that there is an on/off switch on the side of the thermostat. Be sure to check yours! 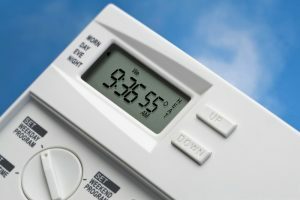 Heat/Cool: Whether you have a 2-in-1 heat pump, or your thermostat connects to both your central air conditioner and furnace, your thermostat has the ability to switch from heating mode to cooling mode, and vice versa. Be sure to check that someone in your household hasn’t accidentally (or, purposefully, if they have different heating and cooling preferences than you) switched the thermostat to cooling mode. “Unoccupied”: Not all thermostats have this option, but some do have the ability to temporarily suspend pre-programmed settings if the building is believed to be unoccupied. Switch your thermostat to “automatic” mode to avoid this misstep. The settings aren’t the only thing to be concerned about. Sometimes, the trouble is elsewhere. The thermostat isn’t a very complicated device, sure, but it can suffer from one of the following issues—all of which are easily resolved by the homeowner themselves or by calling in a pro. Improper Placement: If your thermostat is in a location of your home that’s unusually cool, or warm, it might not get an accurate reading, and therefore can cause temperatures to fluctuate drastically as your heater cycles on to warm a home that’s already quite warm. Old Batteries: Did you look at your thermostat’s display screen only to see there is nothing there but a blank screen? It may be as simple as changing out the batteries! Electrical Problems: If any electrical issues exist within the thermostat, it’s best to have a trained electrician handle it. Call the friendly staff at Boehmer Heating & Cooling for exceptional customer service and thermostate care. © 2008–2019 Boehmer Heating & Cooling. All rights reserved.